Guide to Valencia County, New Mexico ancestry, genealogy and family history, birth records, marriage records, death records, census records, family history, and military records. The county seat is Los Lunas.Valencia County was created on January 9, 1852. The County is located in the center area of the state. 1848 - Valencia county formally became a part of the United States when the Mexican-American War ended in 1848 with the signing of the Treaty of Guadalupe Hidalgo. 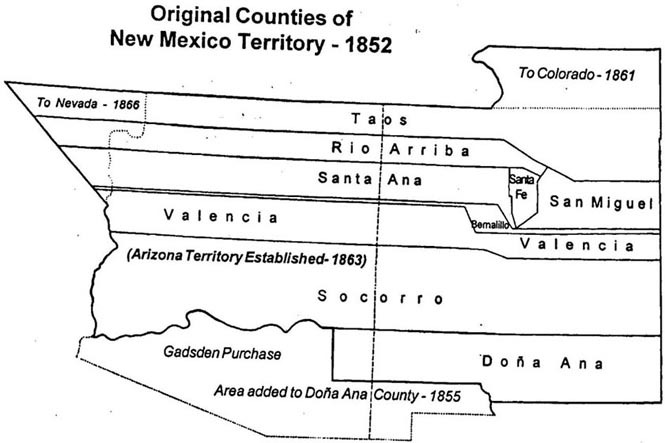 Valencia and other counties in New Mexico Territory in 1852. 9 January 1852 - All New Mexico counties were redefined. Valencia county was extended west to the California border including land in present day Arizona and Nevada. Residents living far from the county seat, probably didn't send many records to the county offices. 24 February 1863 Arizona Territory created from the western half of New Mexico Territory. Valencia County reduced in size to that portion still within New Mexico Territory. 17 March 1981 Valencia county lost the westernmost four-fifths to the creation of Cibola County, New Mexico. For animated maps illustrating New Mexico County boundary changes, "Rotating Formation New Mexico County Boundary Maps" (1845-1981) may be viewed for free at the MapofUS.org website. See also Previous Jurisdictions to Land in Arizona for further details. Bluewater and Ramah Wards were originally within Valencia county. But in 1894, Ramah became part of in the new county of McKinley. Then in 1981, Bluewater became part of the new county of Cibola. Most of the land in New Mexico was originally obtained from the US federal government by a patent. These General Land Office Records are searchable online and most have free images of patents to download. The minimum information needed for a search is the state where the land is located and the name of the person receiving the patent. Surveys and Land Status Records can also be searched here. Local histories are available for Valencia County, New Mexico Genealogy. County histories may include biographies, church, school and government history, and military information. For more information about local histories, see the wiki page section New Mexico Local Histories. ↑ Handybook for Genealogists: United States of America, 10th ed. (Draper, Utah: Everton Pub., 2002), Valencia County, New Mexico. Page 475 At various libraries (WorldCat); FHL Book 973 D27e 2002; Alice Eichholz, ed. Ancestry’s Red Book: American State, County, and Town Sources, Third ed. (Provo, Utah: Ancestry, 2004), 471. ↑ "Courts and Judicial Powers, Sec. 5” Kearny Code: Laws for the Government of the Territory of New Mexico, September 22, 1846 (Santa Fe, N. Mex. : S. W. Kearny, 1846), 47. Digital online edition. ↑ Wikipedia contributors,"Valencia County, New Mexico," in Wikipedia: the Free Encyclopedia,https://en.wikipedia.org/wiki/Valencia_County,_New_Mexico, accessed 12 February 2019. This page was last modified on 13 February 2019, at 01:42.